When ex-Muslim Bonya Ahmed reached out her hand to accept an award in London on Sunday, it was missing her thumb. Islamists hacked it off in Bangladesh, 2015. She had thrown her arms in front of her husband Avijit Roy to shield him from machetes as a mob cut the life out of him for criticising Islam. The attack happened in a crowded public street but the people – including police – stood by and did nothing. The ceremony that recognised this brave woman had to be held in a secret location because London is no longer safe for ex-Muslims, atheists or even secular Muslim believers who dare to say that Islam should not be implemented as a system of laws. Let that sink in: these people had to gather in an undisclosed location.. Not in Bangladesh, but in Britain. The room was filled with free thinkers from around the world: Algeria, Morocco, Jordan, Pakistan, Iran, Tunisia, France, Poland, Turkey. They came from everywhere to attend the International Conference on Freedom of Conscience and Expression. Many had lost their children, their jobs, their homes, or spent time in prison for the simple crime of not believing in a god. Or writing that religion should be kept out of politics and the law courts. Or refusing to fast in Ramadan. There was another person present who was given a standing ovation and an award: a man unfairly accused of “abusive speech” because he criticised Islamism and made jokes about it on Twitter. That man was Richard Dawkins – evolutionary biologist and critic of all religion – who has had a public speaking event cancelled by California Berkeley radio station KPFA. Dawkins speaks stridently against supernatural beliefs without evidence. He is an equal-opportunity abuser of bad ideas. He does not target people. He has made it explicitly clear that he regards Muslim people as the first victims of Islamism, the theocratic political movement that has taken control of large swathes of the Islamic world. This freedom to speak against religious power used to be something celebrated in the West. But unlike the Bangladeshis who simply did nothing as religious fascists murdered an atheist, the institutions of the Left now actively de-platform and character assassinate critics of Islam. They have become, as Quilliam Foundation founder Maajid Nawaz says, regressive. They are the allies of theocrats and their actions may endanger the lives of persecuted minorities within Muslim communities by encouraging those who are trying to silence them. It is champions like Richard Dawkins – decorated and respected in their field – who have created a space for Muslim free thinkers to be who they are without being crushed. And that is why this collection of writers, activists and thinkers from the Muslim world gave him an award. Persecuted people stood up and applauded him – people who have been imprisoned, tortured, lost jobs, lost family, lost their homes. They stood up and cheered for Richard Dawkins because speaking unpleasant truths that offend the religious is necessary for any kind of freedom. People must exchange ideas. That includes jokes and tweets, satire and ridicule, cartoons and criticism. Western countries were once a refuge for Muslim free thinkers, secularists and ex-Muslims. Now the British Home Office denies them visas. Conference organiser Maryam Namazie said some speakers were unable to attend for this reason. 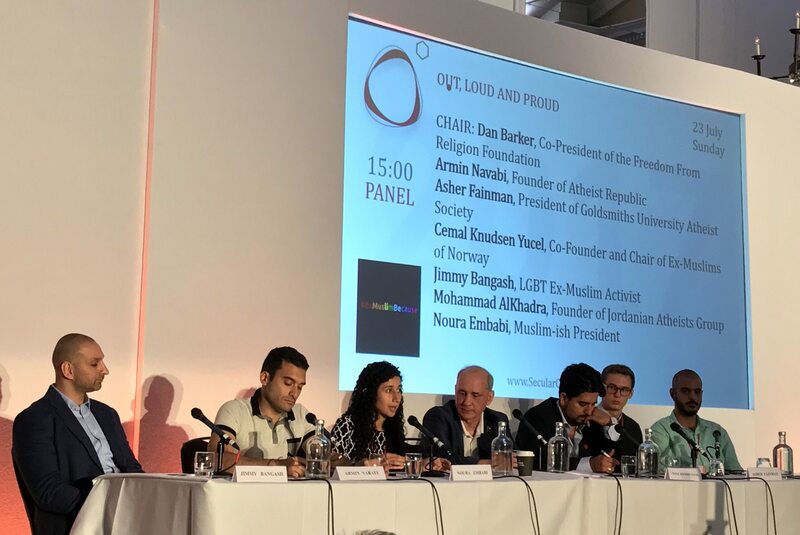 Secular and progressive Muslims such as Asra Nomani and Maajid Nawaz proudly support free speech – even when scientists such as Richard Dawkins make fun of their religion. It is only the theocratic movement of Islamism that seeks to silence critics with character assassination, blasphemy laws, threat of riot and the dirty murder of cartoonists. Yet the regressive left allies itself with them. Mohammad Alkhadra, founder of the Jordanian Atheists Group, told the gathering that it is those in the Muslim world who are on the front line fighting for their freedom and their lives. Alkhadra’s group has only 100 members, but he has to watch while Western leftists treat Islam as the victimised minority in need of protection. Alison Bevege is a freelance journalist from Sydney, Australia, who flew to London to attend the International Conference on Freedom of Conscience and Expression.